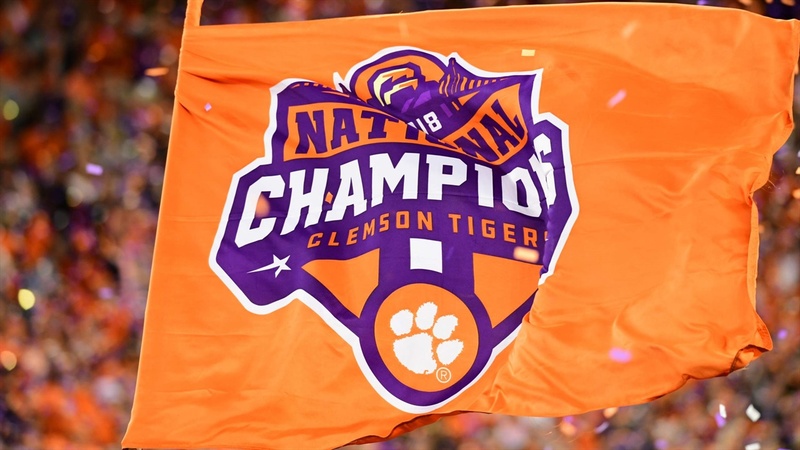 If there hadn’t been bad weather in Orlando that fateful day in June 2017, Clemson graduate and graphic designer T.J. Harley may never have been the one to design the 2018 National Championship logo for his alma mater. Harley had just flown into Orlando for a college athletics conference and headed to baggage claim to pick up his luggage. Because of the bad weather, the airline wasn’t bringing bags off the plane and so he was stuck waiting. Good thing, because waiting for luggage alongside him were several Clemson Athletic Department officials who were in town to take part in Tim Bourret’s induction into the COSIDA Hall of Fame. Harley and the crew had worked together previously when Harley was the creative director at the Collegiate Licensing Company (now IMGCL), which had Clemson as a client. The news in baggage claim came that there would be a long delay before passengers could get their luggage. “Let’s go grab a bite to eat and catch up,” the group told Harley. The group talked for over an hour — Harley about he how started his own design company (Harley Creative) with clients like Hanes, Mercedes-Benz Stadium and the College Football Hall of Fame and the Clemson group about the transformation for the athletic department’s communications and marketing efforts that led to Clemson becoming an industry leader in digital media. The Clemson contingent invited Harley to visit Clemson and meet members of the Creative Solutions department, including lead graphic designer Jeff Kallin. Kallin, of course, designed Clemson’s famous 2016 National Championship logo. He was familiar with Harley’s work and was aware that he was a fellow Clemson grad. The group got together in Clemson about a month later and talked shop. But 16 months later when the Tigers were in the middle of another undefeated championship run, Clemson came calling. But would Harley take the project? “Of course, there was no way I was saying no to that,” Harley said. Once Harley was on board, it was time to get to work. But projects like these create a dilemma — the Clemson Football team was weeks and wins away from needing a Championship logo but there is still a need for the appropriate time to brainstorm, draft, review and edit before the logo is ready to be published and placed on retail items. There are plenty of celebratory t-shirts that never see the light of day after the team featured didn’t actually end up winning the championship and the same happens with logos — one gets made for each of the four College Football Playoff teams but only the winner’s gets used. So, the timeline went like this: Kallin reached out to Harley after the team won the ACC Atlantic Division and then the design and review process kicked into high gear after the Tigers won the ACC Championship. Harley sent along eight initial concepts and the group reviewed about 30 variations before narrowing it down to the final selection. The group involved in the process was small — Harley, Kallin, Associate Athletics Director Tim Match, Deputy Director of Athletics Graham Neff and Director of Athletics Dan Radakovich. Clemson worked with licensing partner IMG College Licensing to utilize the logo on officially licensed items, including hats, shirts, logos and other souvenirs — more than 1,000 items in total. All thanks to a rainy day and a baggage delay.